Burning, watering, swelling, overnight crusting. PinkEye Relief® Eye Drops are homeopathic eye drops with 100% natural active ingredients temporary relief for symptoms such as redness, burning, watering, inflammation, the sensation of grittiness, and overnight crusting in the eyes. PinkEye Relief® drops are safe and gentle to use with no known side effects, interactions with other medications, or contraindications. PinkEye Relief® PM Ointment is a homeopathic lubricating eye ointment with 100% natural active ingredients formulated to relieve your nighttime pink eye symptoms such as burning, watering, swelling, sensations of grittiness, or overnight crusting of the eye. Trying to get through the day with red, gritty, and irritated eyes can be difficult. 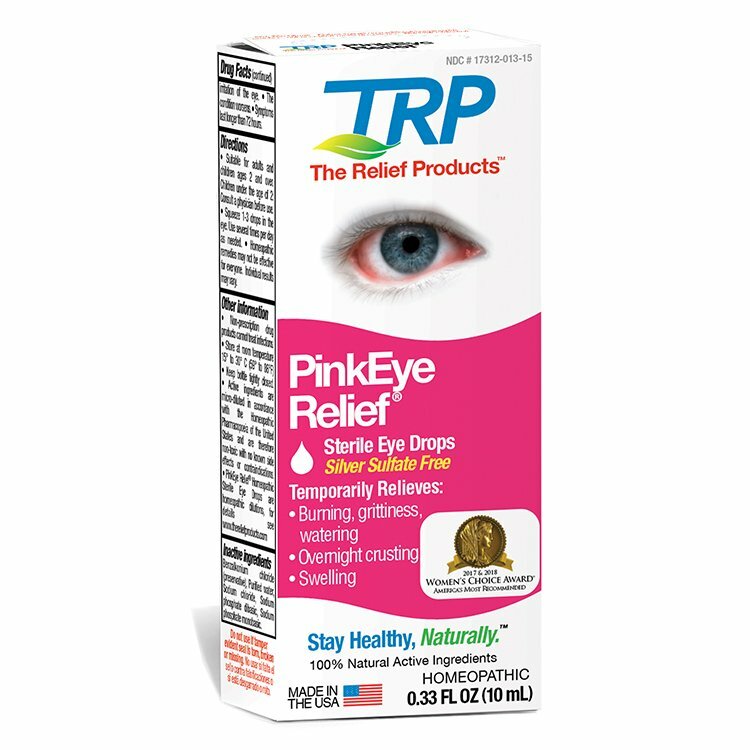 Thankfully, there is PinkEye Relief® — a homeopathic eye drop made with 100% natural active ingredients formulated to help temporarily relieve your pink eye symptoms. Winner of the 2019 Women’s Choice Award, PinkEye Relief® provides temporary relief from symptoms such as redness, burning, watering, inflammation, sensation of grittiness, and overnight crusting in the eyes. Use PinkEye Relief® drops at the first sign of irritation or inflammation to help alleviate your symptoms. Often times, night-time is the worst time for pink eye symptoms. We’ve all been there — you or your little one wakes up in the morning with uncomfortable, gritty, and crusting eyelids. That’s where PinkEye Relief® PM Ointment comes in. PinkEye Relief® PM is a night-time, preservative-free eye ointment formulated to alleviate those dreadful pink eye symptoms overnight. PinkEye Relief® PM works in a two-part system: First, the base ingredients of mineral oil and white petrolatum work to keep the area surrounding the eye clean and lubricated. Secondly, we’ve added six (6! ), 100% natural active ingredients, all formulated to help fight pink eye symptoms while you sleep. PinkEye Relief® PM will help to alleviate some of the pain and discomfort before bed-time, allowing for a restful night’s sleep. This also allows your body time to heal and recover naturally. Let’s face it, when you have pink eye, you want it gone, and fast. For best results, we always recommend using PinkEye Relief® Eye Drops during the day, and PinkEye Relief® PM ointment at night. Treat your pink eye symptoms around the clock and feel better, sooner. Pink Eye is one of the most common eye conditions, affecting 3-6 million people annually in the United States. Pink eye may be due to an inflammation of the outermost layer of the eye, although various conditions may cause symptoms similar to pink eye. For adults, viral causes are most common, while bacterial causes are more prevalent in children. Although pink eye does occur in adults, it most often affects young children who are more vulnerable. Typically, people see improvement in their symptoms after 1-2 weeks. If you are experiencing visual loss, significant pain, sensitivity to light, or your symptoms have not improved after one week, further diagnosis and treatment may be required. A physician’s counsel should be sought out to rule out any serious causes. For a great first-hand account of how PinkEye Relief® drops can help, check out this moms experience! Viral pink eye usually causes excessive eye watering and light discharge from the eye. The most common cause of viral pink eye are adenoviruses, which are common viruses that typically cause common-cold symptoms. This is why often times pink eye is accompanied by other symptoms such as a sore throat, cough, congestion, a runny nose, or an upper respiratory infection. Bacterial pink eye often causes red eyes and produces a thick, sticky discharge or puss. Bacterial pink eye can affect one or both eyes. It is highly contagious and caused by common bacterial infections. Bacterial pink eye can cause damage to the eye if left untreated. Allergic pink eye often affects both eyes and causes symptoms such as itching, redness, and excessive tearing of the eye. Allergic pink eye is a reaction to an irritant, and therefore is not contagious. Pollen is the most common allergen to cause pink eye, and often times is associated with other allergy-like symptoms such as sneezing, congestion, or a runny nose. Giant Papillary pink eye (GPC) is another type of allergic pink eye. Giant papillary pink eye occurs when a foreign body causes prolonged irritation in the eye. This condition usually affects both eyes, and often times causes contact lens intolerance. Other symptoms include itching, heavy discharge, tearing of the eye, and red bumps on the underside of the eyelids. It can be difficult to diagnose which type of pink eye you may have based solely on your symptoms. Your eye doctor will usually prescribe antibiotics or allergy medication for more severe forms of pink eye. For these reasons we always recommend contacting your doctor or physician if you develop pink eye symptoms. Despite these precautions, you or your child may still develop pink eye. If you have contagious pink eye, be mindful of others and do your part to keep the infection from spreading. If your child is affected, tell his or her teacher about the infection so precautionary steps can be taken to sanitize the classroom or daycare center. Additionally, if you are an adult and have pink eye, it is recommended to stay home from work until your symptoms have cleared as to not spread the infection. It is also recommended that you consult your doctor or physician on the length of time you or your child should abstain from interaction with others without risk of spreading the infection. It is typically safe to return to work or school anywhere from 3-5 days after diagnosis, given you are taking proper precautions and receiving treatment. "Viral and bacterial pink eye is contagious and spread very easily. Since most pink eye is caused by viruses for which there is usually no medical treatment, preventing its spread is important." -WebMD. Poor hand-washing is the main cause of the spread of pink eye. Wash your hands often with soap and warm water. Wash your hands immediately if you’ve touched an affected person’s eyes, linens. or clothing. If soap and water are not available, use an alcohol-based hand sanitizer that contains at least 60 percent alcohol. Do not use the same eye drop dispenser/bottle for infected and non-infected eyes—even if it is for the same person. Avoid sharing items such as towels, blankets, and pillowcases. If you wear eyeglasses, be sure to clean them regularly. Do not share ANY makeup, (mascara, eyeliner, eye shadow, brushes, etc.) contact lenses, contact containers, or eyeglasses. You are experiencing a thick, white, yellow, or green discharge that forms a crust on the eyelid. Keep bottle tightly closed. Non-prescription drug products cannot treat infections. Non-prescription drug products cannot treat infections. · Active ingredients are micro-diluted in accordance with the Homeopathic Pharmacopoeia of the United States and are therefore non-toxic with no known side effects or contraindications. How does it work PinkEye Relief work? Should I see a doctor for pink eye? Pink eye symptoms should always be diagnosed by a doctor to ensure that the most appropriate treatment or treatments are prescribed and that the condition is properly monitored. Some forms of pink eye can only be treats with prescription eye drops. How long do I use it before I get relief? Every individual is different and since the homeopathic active ingredients are stimulating the body’s response, results will vary from person to person. Relief on average should be felt within a matter of days. Can pink eye be contagious? There are many different forms of pink eye some of which can be highly contagious. You may be contagious and should see an eye doctor if the eye has a yellowish discharge, excessive watering or itchiness. Homeopathic remedies have a 200-year history of having no known adverse reactions or drug interactions. They are safe for infants, children and adults. A physician should always be consulted to rule out serious causes.